Bulgaria – the country of legends for gods and heroes is as well a country of the famous rose oil. This tour give’s the opportunity to visit the Rose Valley, to smell the rose oil perfume, to take part in rose pickings in small villages, to visit a traditional rose distillery and get acquainted with the enigmatic Thracian civilization and the eternal Bulgarian folklore. And last but not least – to visit Bulgarian capital Sofia and one of the most ancient cities in Europe – Plovdiv. Day 1– Arrival to Sofia. Arrival at Sofia airport. Transfer to the hotel. Accommodation at the hotel. Dinner. Overnight stay in Sofia. Breakfast. Sightseeing tour of Sofia – St. Nedelya Cathedral, St. George Rotunda, Banya Bashi Mosque, Sofia Synagogue – the largest synagogue on the Balkan peninsula, the Presidency and the seat of the Government, Ivan Vazov National Theater, the former Royal Palace, Russian Church of St. Nicolas, St. Sophia basilique, St. Alexander Nevsky Cathedral, National Assembly Square with the monument of the Russian tsar Alexander II named “King Liberator”, Sofia University and National Library. Time at leisure. Dinner. Overnight stay in Sofia. After breakfast we start our journey to world famous Rose Valley. 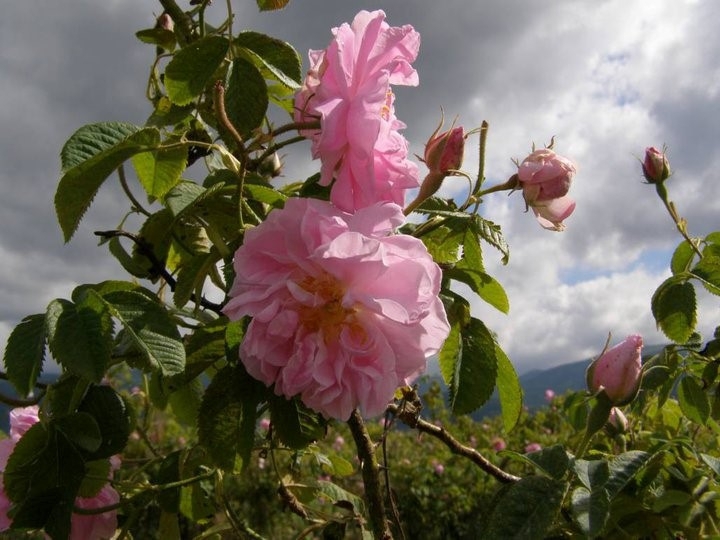 The Rosa Damascena, known as the Damask or Castile rose, is the greatest treasure in the region of Kazanlak and it is one of the nation’s symbols. Under the influence of the country’s unique climate and soil, this rose gradually developed into a Bulgarian strain distinct from Damask roses elsewhere. That is why at the beginning of the 19th century this rose was named the Kazanlak Damask rose and the valley to the south of the Central Balkans came to be known as the Valley of the Roses. Here is produced 80% of the world production of rose oil, which is in the base of the highest quality perfumes. For centuries, roses have been the basis for the livelihood of this region. Arrival in Kazanlak at 11 h. Kazanlak is the center of the Valley of the Roses, the home of the Thracian kings, and an attractive tourist destination. The country’s largest and best preserved Thracian tombs are found here, and they are included among the UNESCO World Heritage Sites, along with the Museum of Roses. At 11 h visit of the “The bread of the Bulgarians: ritual, customs and faith” – exhibition and tasting of traditional bakery products, park Rosarium Only for 30 May or visit of the only museum in the world, dedicated to the oil-yielding plant – rose. The Museum of the Rose is housed in the old building of the Rose Institute. The rose is one of the symbols of Bulgaria.The Rose Museum stores more than 15 000 exponents related to rose-picking and rose-production in Bulgaria. At 12 h - Free time for lunch. At 15 h visit of the “Kazanlak Tomb”. It is an original Thracian tomb from 4th – 3rd century BC. It is under a special storage regime. Its duplicate, constructed in scale 1:1, which presents the architecture, the archaeological materials and the wall-paintings of the Kazanlak Tomb, is situated next to it. This Tomb is one of the most significant monuments of the Thracian culture in the Bulgarian lands, included in the list of the global cultural inheritance of UNESCO in 1979. The Thracians are an enigmatic people created a remarkable civilization in the time of the constriction of the pyramids in Egypt. Over 15 000 Thracian tombs have been discovered on the territory of Bulgaria. They are 2000 – 3000 years old. Many of them are situated in the Valley of Roses and this is the reason this valley to have a second name – the Valley of the Thracian Kings. There is a big number of Thracian tombs. At 17 h departure to Stara Zagora. Check- in at the hotel. Overnight. At 12 h free time for lunch in Kazanlak. At 13,30 h visit of the ethnographic complex “The Tower”. The tourists can taste a jam roses jam and rose liqueur as welcome drink and meet the traditions. At 14,30 departure to Stara Zagora. Walking tour of the city. Visit of The Neolithic Dwellings Museum. It contains finds that are extremely important for the history of mankind. It exhibits the two best-preserved Neolithic dwellings in Europe that date back to the 6th millennium BC. Visit of The forum of the antique Roman town Augusta Trayana. It is an archaeological site in the central part of the town of Stara Zagora. The antique forum complex is one of the most monumental installations in the Roman town of Augusta Trayana. The founder of the town was Emperor Trayan (98 - 117), where the name of the town comes from. Time for explore the city. Overnight. Free time for lunch in Kazanlak. At 14 h 30 visit of “Goliamata Kosmatka”- one of the most interesting Thracian tombs. Archaeologists reveal it several years ago. It is the tomb of the Thraciann King Seuthes III. This monument of the Thracian civilization is 2500 years (5th century BC). There are questions about its construction, which still awaits an answer. At 15 h 30 departure to Plovdiv. Free time to enjoy the vibrant life of this ancient and modern city. Plovdiv is one of the oldest cities in Europe – the beginning of its history dates back to 4,000 years BC. In the beginning the ancient settlement was situated on the natural elevation between Nebet, Taksim and Dzhambaz hills (the Three Hills).The visit of Plovdiv includes 2 parts : “On the Roman Path” and the visit of the Old town of the city. The walking tour begins by the Roman Forum and the Odeon. The forum complex, parts of which can nowadays be seen from both sides of the central post office, is the largest in Bulgaria. It was built in the end of the 1st century AD, when Philipopolis obtained a new city planning scheme and a center (forum) according to a Roman model. The Odeon is situated in the northern part of the Forum. The ancient Odeon has 300-350 seats and served as a domicile of the City Council in Philipopolis. The antique stadium in Plovdiv was built according to the model of the Delphi Stadium – only 12 of this kind are preserved in the world. It is approximately 200 meters long; only its northern part and a part of the fortified wall from the 2nd – 4th century have been exposed. Sports contests were conducted here in the past, as well as gladiator fights and animal fights – the renowned Pitian, Alexandrian and Kendresian games. The Antique Theater in Plovdiv is situated in the Old Town. The Roman Theatre was built in the beginning of the 2nd century AD during the ruling of Emperor Trayan (98 – 117 AD). It is one of the best preserved antique theaters in the world. Its visible part (the theatron) is amphitheatrically situated and separated into two ranges – each consisting of 14 rows of seats, made of marble. This antique theater was used to accommodate 5 to 7 thousand viewers. Old Plovdiv Architectural Reserve is a well-preserved complex where on a relatively small area visitors can take walks through different historical ages, see ancient buildings adapted to the modern way of life and feel the spirit of the town from the Bulgarian Revival Period. Time for explore the town and for shopping. Dinner and overnight in Plovdiv. Depending on the time of the flight, departure from Plovdiv to the airport of Sofia. Price varies by number of participants and by date of travel. Contact your travel agent. •	Walking tours of Sofia, Stara Zagora, Plovdiv. The consequence of the program could be changed depending on the program of the Municipality of Kazanlak.